On March 15, 2013 Arctic sea ice likely reached its maximum extent for the year, at 15.13 million square kilometers (5.84 million square miles). The maximum extent was 733,000 square kilometers (283,000 square miles) below the 1979 to 2000 average of 15.86 million square kilometers (6.12 million square miles). The maximum occurred five days later than the 1979 to 2000 average date of March 10. The date of the maximum has varied considerably over the years, with the earliest maximum in the satellite record occurring as early as February 24 in 1996 and as late as April 2 in 2010. This year’s maximum ice extent was the sixth lowest in the satellite record. 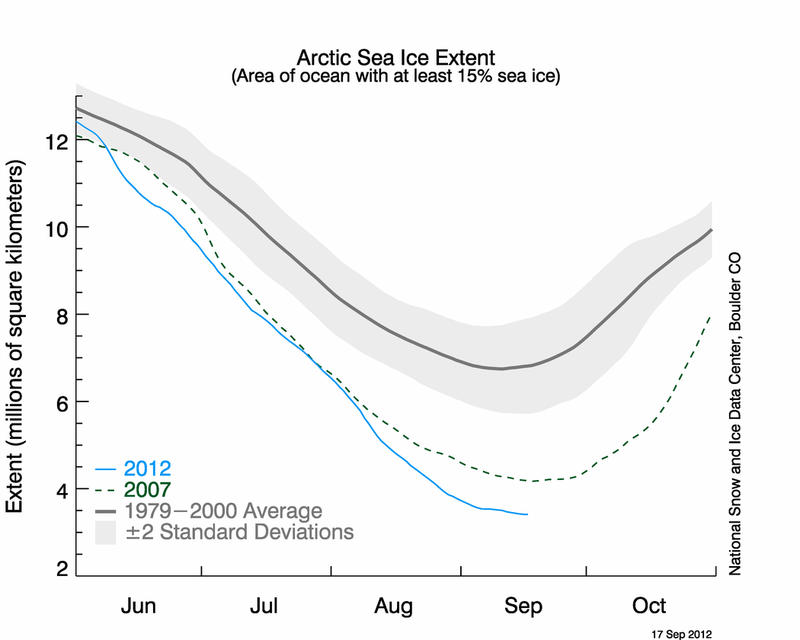 The lowest maximum extent occurred in 2011. The ten lowest maximums in the satellite record have occurred in the last ten years, 2004 to 2013. Figure 2. 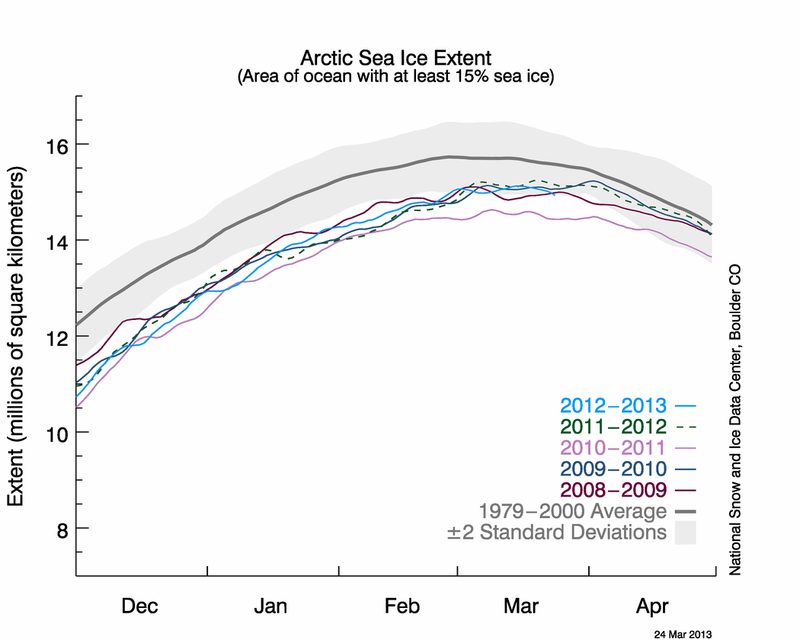 The graph above shows Arctic sea ice extent as of March 24, 2013, along with daily ice extent data for the previous five years. 2012 to 2013 is shown in blue, 2011 to 2012 in green, 2010 to 2011 in pink, 2009 to 2010 in navy, and 2008 to 2009 in purple. The 1979 to 2000 average is in dark gray. The gray area around this average line shows the two standard deviation range of the data. 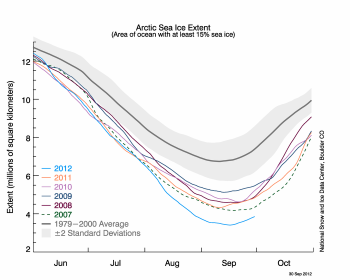 Sea Ice Index data. Over the 2012 to 2013 winter season, sea ice extent grew a record 11.72 million square kilometers (4.53 million square miles). 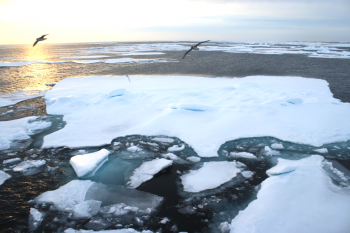 The record growth was primarily a result of the record low minimum last September, leaving a greater extent of ocean surface uncovered in ice to re-freeze this winter. 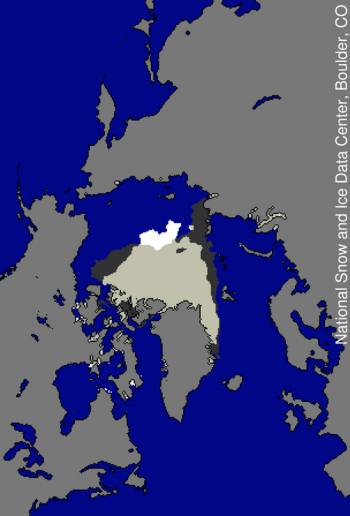 This seasonal ice gain is 645,000 square kilometers (249,000 square miles) higher than the previous record (2007 to 2008) and 2.63 million square kilometer (1.02 million square miles) higher than the 1979 to 2000 average. Last autumn’s record low and this winter’s record ice growth indicate a more pronounced seasonal cycle in Arctic sea ice and the increasing dominance of first-year ice in the Arctic. At the beginning of April, NSIDC scientists will release a full analysis of winter conditions, along with monthly data for March. 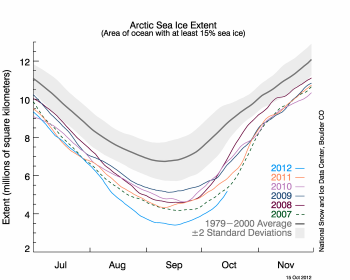 For more information about the maximum extent and what it means, see the NSIDC Icelights post, the Arctic sea ice maximum. For previous analyses, please see the drop-down menu under Archives in the right navigation at the top of this page. Arctic sea ice extent for January 2013 was well below average, largely due to extensive open water in the Barents Sea and near Svalbard. 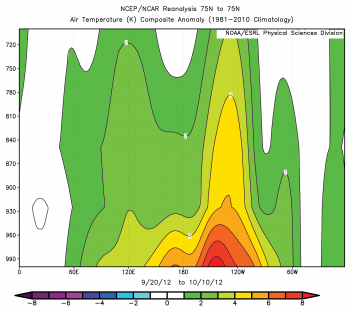 The Arctic Oscillation also remained in a primarily negative phase. Antarctic sea ice remained extensive due to an unusual northward excursion of ice in the Weddell Sea. December of 2012 saw Northern Hemisphere snow cover at a record high extent, while January 2013 is the sixth-highest snow cover extent on record since 1967. The average sea ice extent for January 2013 was 13.78 million square kilometers (5.32 million square miles). This is 1.06 million square kilometers (409,000 square miles) below the 1979 to 2000 average for the month, and is the sixth-lowest January extent in the satellite record. The last ten years (2004 to 2013) have seen the ten lowest January extents in the satellite record. As has been the case throughout this winter, ice extent in the Atlantic sector of the Arctic Ocean remained far below average. While the Kara Sea was completely iced over, nearly all of the Barents Sea remained ice free, and open water was present north of the Svalbard Archipelago. The lack of winter ice in the Barents Sea and the vicinity of Svalbard has been a common feature of recent years. Recent work by Vladimir Alexeev and colleagues at the University of Alaska Fairbanks provides further evidence that this is related to a stronger inflow of warm waters from the Atlantic as compared to past decades. On the Pacific side, the ice edge in the Bering Sea continued to extend slightly further to the south than usual. Also, a new paper by Jinlin Zhang and colleagues at the University of Washington analyzed the effect of the strong August 2012 cyclone on last year’s record sea ice minimum. While they found a large effect in the immediate wake of the storm, the effect declined quickly and overall it had only a small effect on the final September minimum extent. Figure 2. 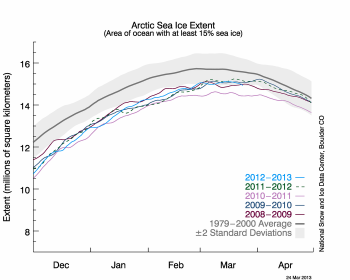 The graph above shows Arctic sea ice extent as of February 4, 2013, along with daily ice extent data for the previous five years. 2012 to 2013 is shown in blue, 2011 to 2012 in green, 2010 to 2011 in pink, 2009 to 2010 in navy, and 2008 to 2009 in purple. The 1979 to 2000 average is in dark gray. The gray area around this average line shows the two standard deviation range of the data. 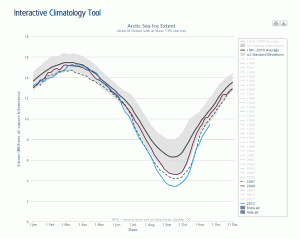 Sea Ice Index data. Through the month of January, the Arctic gained 1.36 million square kilometers of ice (525,000 square miles), which is slightly higher than average for the month. 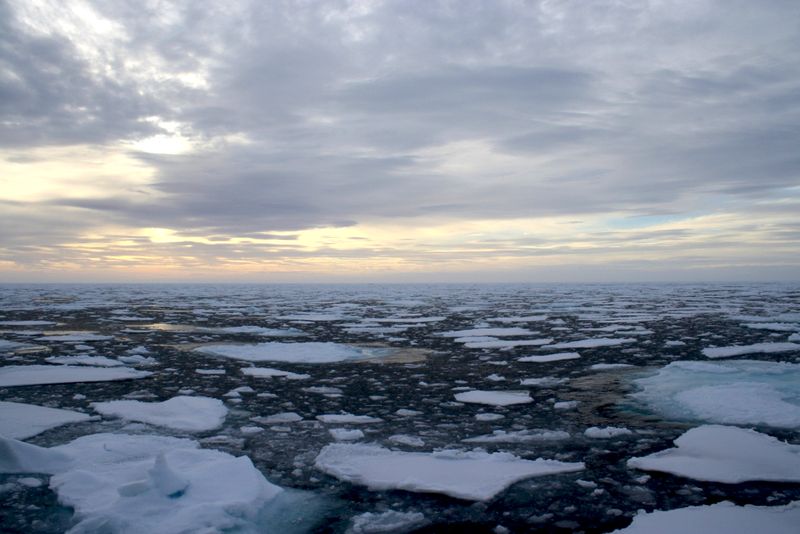 Air temperatures at the 925 hPa level were 2 to 5 degrees Celsius (4 to 9 degrees Fahrenheit) higher than average across much of the Arctic Ocean. 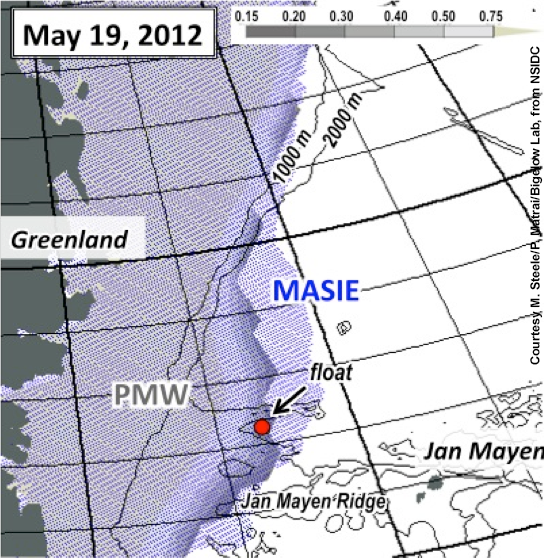 Conditions were especially warmer than average near Svalbard where ice-free conditions persist. 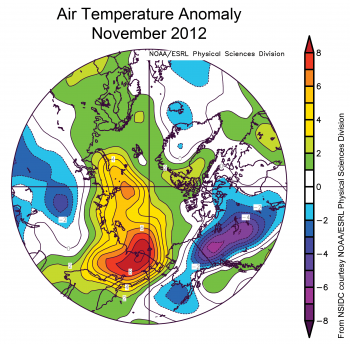 Below average temperatures characterized parts of northern Eurasia and northwestern Canada. 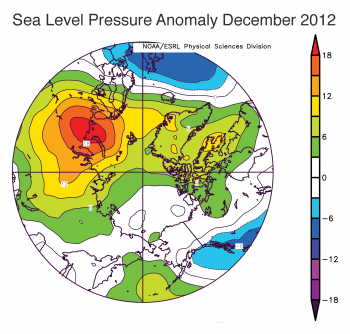 The dominant feature of the Arctic sea level pressure field for January 2013 was unusually high pressure over the central Arctic Ocean, consistent with a predominantly negative phase of the Arctic Oscillation. Figure 3. 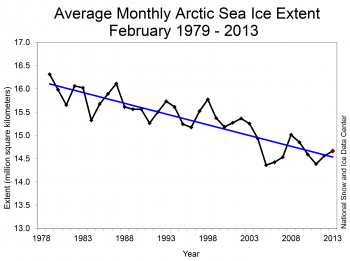 Monthly January ice extent for 1979 to 2013 shows a decline of -3.2% per decade. 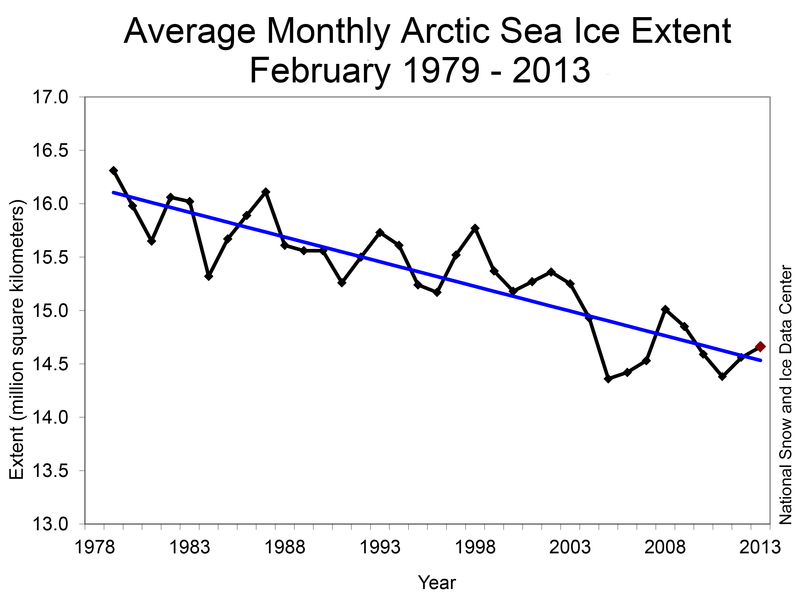 Average Arctic sea ice extent for January 2013 was the sixth lowest for the month in the satellite record. 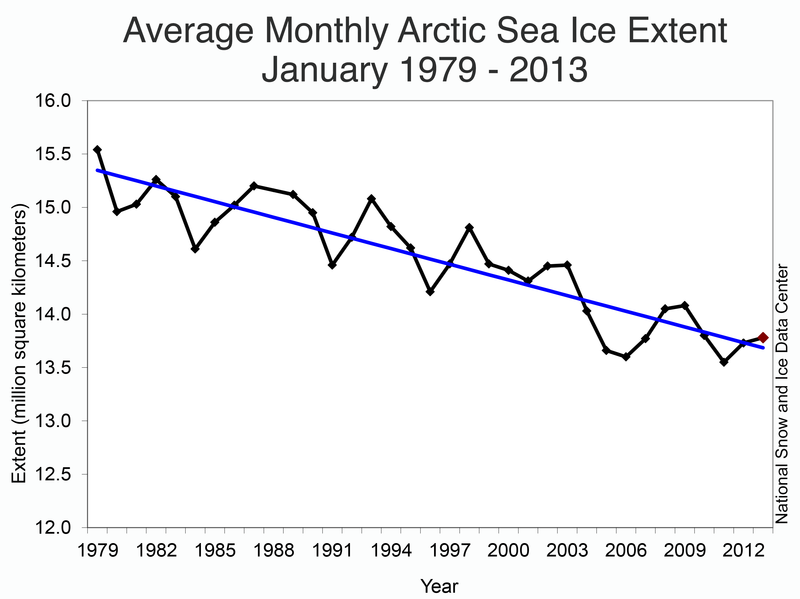 Through 2013, the linear rate of decline for January ice extent is -3.2 percent per decade relative to the 1979 to 2000 average. Figure 4. 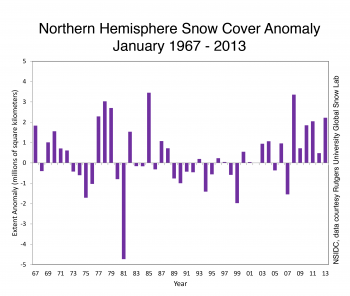 This graphs shows snow cover extent anomaly in the Northern Hemisphere for January from 1967 to 2013. 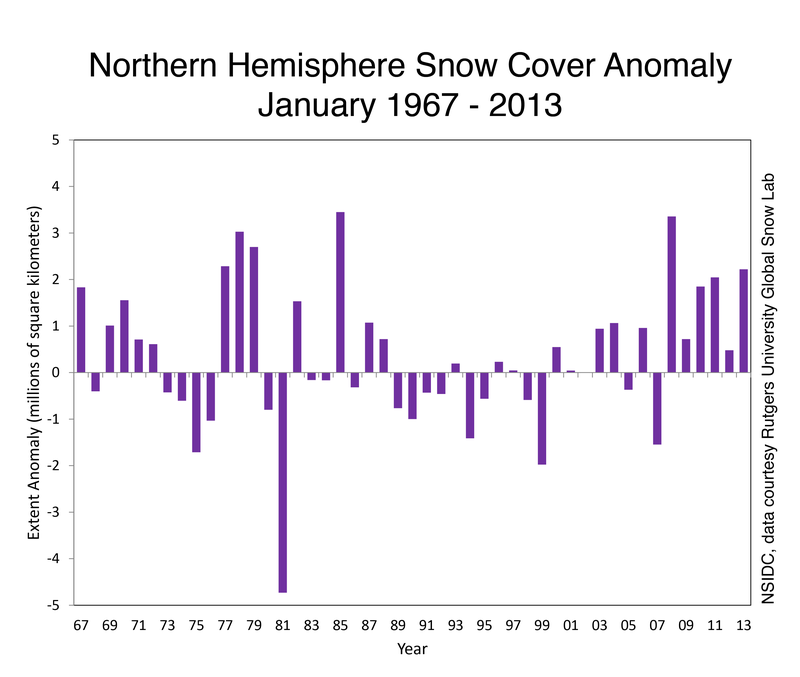 January 2013 is the sixth-highest snow cover extent on record since 1967. 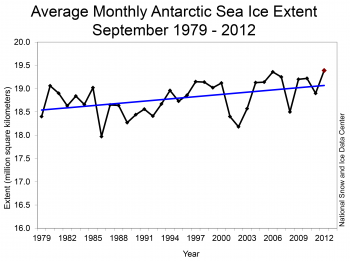 The anomaly is relative to the 1971 to 2000 average. As noted in a previous post, Northern Hemisphere snow cover extent for June 2012 set a record low, continuing a downward trend in springtime snow extent. Satellite data from the Rutgers University Global Snow Lab show that after Northern Hemisphere snow cover extent for December 2012 reached a record high for the month of 46.27 million square kilometers (17.86 million square miles), extent during January increased to a monthly average of 48.64 million square kilometers (18.78 million square miles). This was the sixth-highest January extent in the record, dating back to 1967. Snow cover was higher than average throughout much of the western United States as well as northern Europe and eastern China. Snow cover was lower than normal over the central U.S., and much of southern Asia, including the Tibetan Plateau. 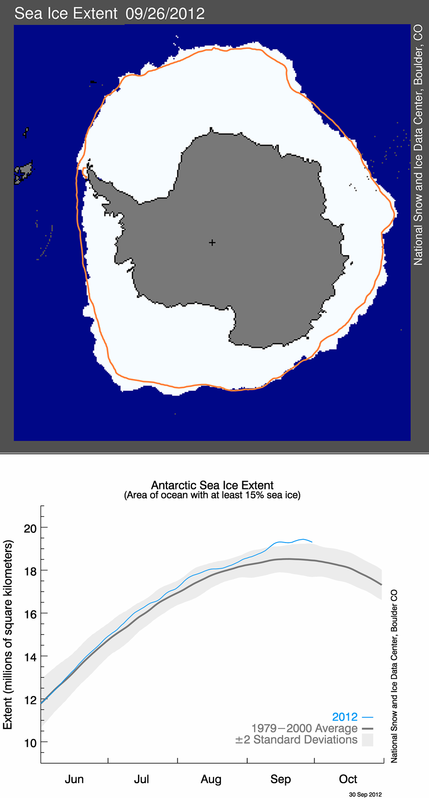 Turning to Antarctica, we note that January 2013 saw an unusual northward (towards the equator) excursion of sea ice in the Weddell Sea. The ice edge was found approximately 200 to 300 kilometers (124 to 186 miles) beyond its typical location. 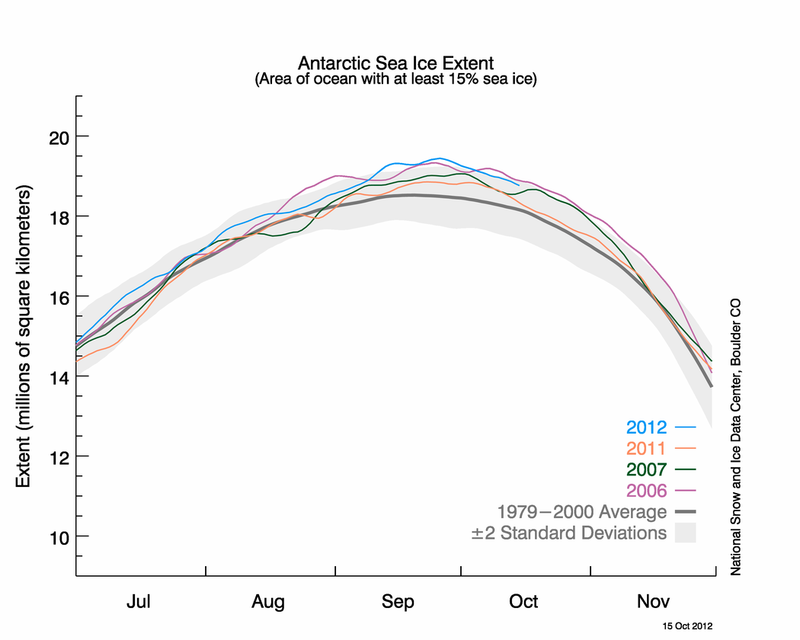 Overall, sea ice extent in the Antarctic was nearly two standard deviations above the mean for most of the month. 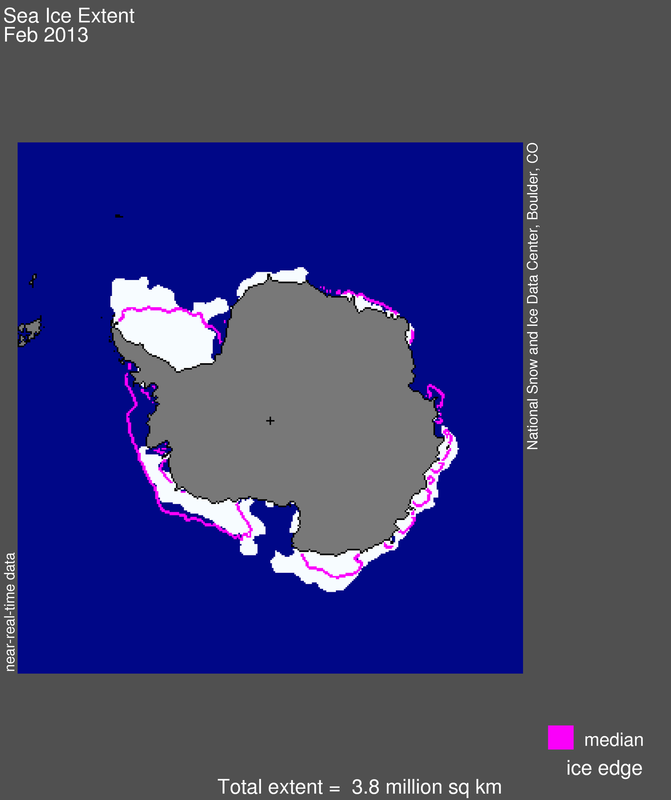 The cause of this is very unusual sea ice pattern appears to be persistent high pressure in the region west of the Weddell Sea, across the Antarctic Peninsula to the Bellingshausen Sea. This pressure pattern means that winds are tending to blow to the north on the east side of the Peninsula, both moving the ice northward and bringing in cold air from southern latitudes to reduce surface melting of the ice as it moves north. In recent years, the surface of the Greenland Ice Sheet has experienced strong melting, but the 2012 melt season far exceeded all previous years of satellite monitoring, and led to significant amounts of ice loss for the year. 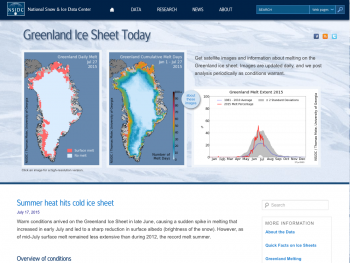 NSIDC’s new Web site, Greenland Ice Sheet Today presents images of the widespread surface melt on Greenland during 2012 and scientific commentary on the year’s record-breaking melt extent. Throughout the coming year, the site will offer daily satellite images of surface melting and periodic analysis by the NSIDC science team. 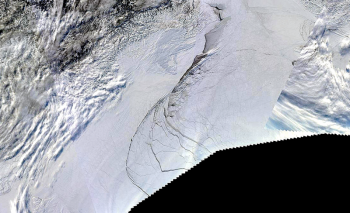 NSIDC scientists at the University of Colorado Boulder developed Greenland Ice Sheet Today with data from Thomas Mote of the University of Georgia, and additional collaboration from Marco Tedesco of the City University of New York. The Greenland Ice Sheet contains a massive amount of fresh water, which if added to the ocean could raise sea levels enough to flood many coastal areas where people live around the world. The ice sheet normally gains snow during winter and melts some during the summer, but in recent decades its mass has been dwindling. Alexeev, V.A., Ivanov, V.V., Kwok, K., and Smedsrud, L.H. 2013. 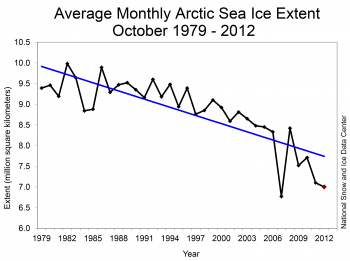 North Atlantic warming and declining volume of arctic sea ice. The Cryosphere Discussions 7, 245-265, doi: 10.519/tcd-7-245-2013. Zhang, J., R. Lindsay, A. Schweiger, and M. Steele. 2013. 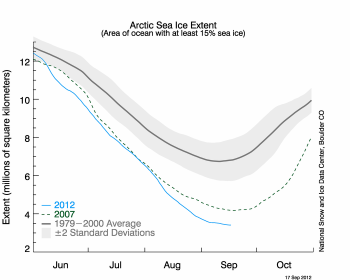 The impact of an intense summer cyclone on 2012 Arctic sea ice retreat. Geophysical Research Letters, In press, doi: 10.1002/grl.50190. Arctic sea ice extent for December 2012 remained far below average, driven by anomalously low ice conditions in the Kara, Barents, and Labrador seas. Thus far, the winter has been dominated by the negative phase of the Arctic Oscillation, bringing colder than average conditions to Scandinavia, Siberia, Alaska, and Canada. The average sea ice extent for December 2012 was 12.20 million square kilometers (4.71 million square miles). This is 1.16 million square kilometers (448,000 square miles) below the 1979 to 2000 average for the month, and is the second-lowest December extent in the satellite record. At the end of December, ice extent in the Atlantic sector remained far below normal, as parts of the Kara and Barents seas remained ice-free. Ice has also been slow to form in the Labrador Sea, while Hudson Bay is now completely iced over. On the Pacific side, ice extent is slightly above normal, with the ice edge in the Bering Sea extending further to the south than usual. The Bering Sea has seen above-average winter ice extent in recent years and is the only region of the Arctic that has exhibited a slightly positive trend in ice extent during the winter months. Figure 2. 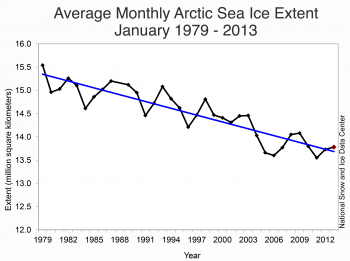 The graph above shows Arctic sea ice extent as of January 7, 2013, along with daily ice extent data for the previous five years. 2012 to 2013 is shown in blue, 2011 to 2012 in green, 2010 to 2011 in pink, 2009 to 2010 in navy, and 2008 to 2009 in purple. The 1979 to 2000 average is in dark gray. The gray area around this average line shows the two standard deviation range of the data. 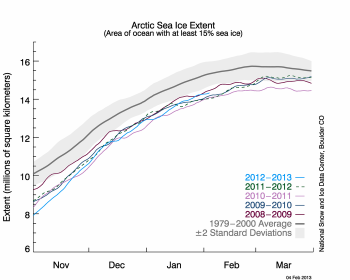 Sea Ice Index data. 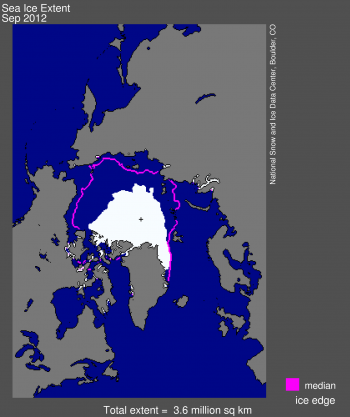 Although the Arctic gained 2.33 million square kilometers of ice (900,000 square miles) through the month, ice extent in the region remained far below average. Ice growth remained slow in the Kara and Barents seas where air temperatures were 3 to 5 degrees Celsius (5 to 9 degrees Fahrenheit) higher than normal. Air temperatures over Greenland and the Canadian Archipelago were also slightly above average, while temperatures over Alaska were 2 to 7 degrees Celsius (4 to 13 degrees Fahrenheit) lower than average. Winter sea ice variability is largely confined to the peripheral seas surrounding the Arctic Ocean. In the past, the dominant pattern of winter sea ice variability showed a distinct out-of-phase relationship between the Labrador and Greenland-Barents seas, with a less prominent seesaw pattern in the Pacific sector, between the Bering Sea and the Sea of Okhotsk. In recent winters however, this out-of-phase relationship no longer appears to hold in the Atlantic sector. Ice extent has remained below average in both the Labrador and the Barents seas. Successive winters with anomalously low sea ice in the North Atlantic have led to higher mortality rates for seals in the region. The United States government recently added the bearded and ringed seals to the list of creatures threatened under the Endangered Species Act. Figure 3. 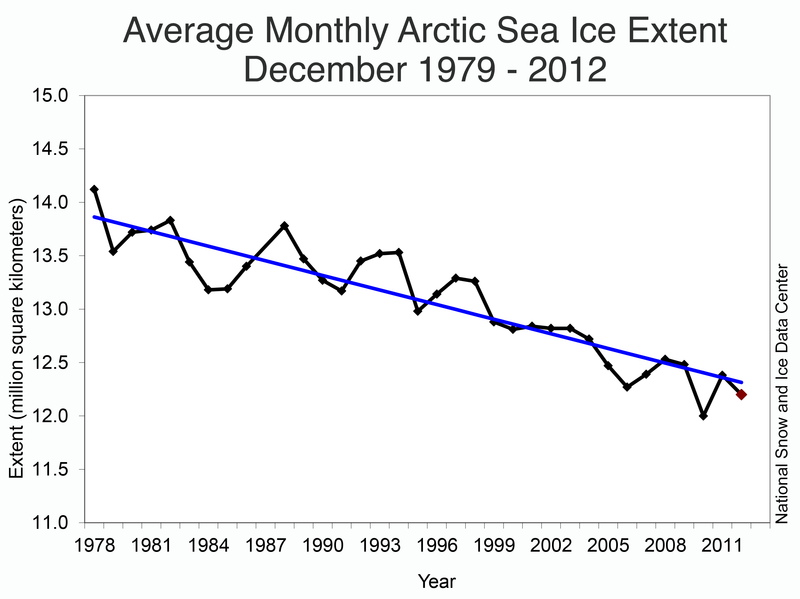 Monthly December ice extent for 1979 to 2012 shows a decline of -3.5(+/-0.6)% per decade. 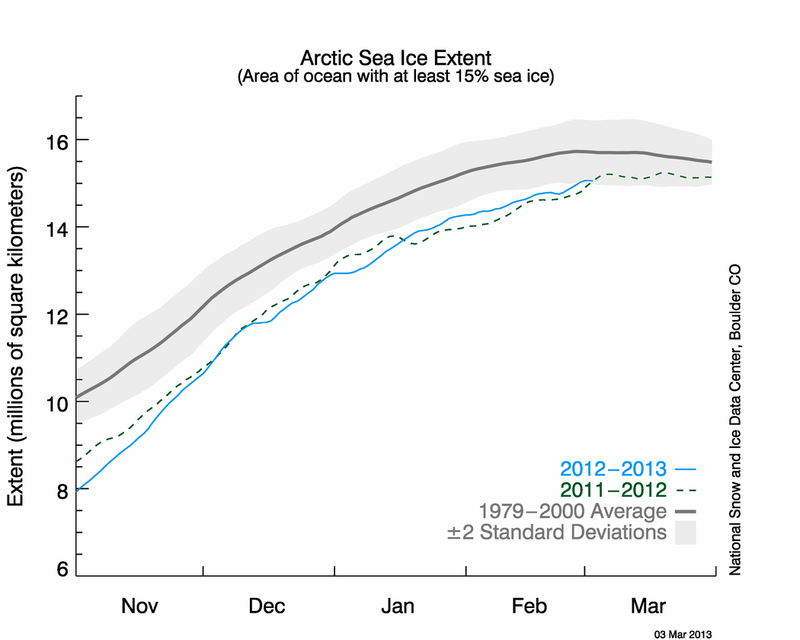 Average Arctic sea ice extent for December 2012 was the second lowest for the month in the satellite record. 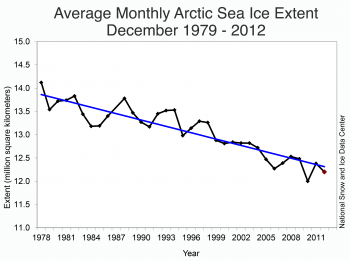 Through 2012, the linear rate of decline for December ice extent is -3.5 percent per decade relative to the 1979 to 2000 average. While the winter ice extent for the Arctic as a whole shows only modest declines, large negative trends are now found in nearly all of the peripheral seas, with the exception of the Bering Sea. Figure 4. This image shows sea level pressure anomalies averaged for December 2012, compared to averages over the period 1981 to 2010. Sea level pressure was above average over Eurasia, extending into the Kara and Barents seas, and across Greenland and the Canadian Archipelago. The most important mode of variation in the Arctic’s winter atmospheric circulation is the Arctic Oscillation. 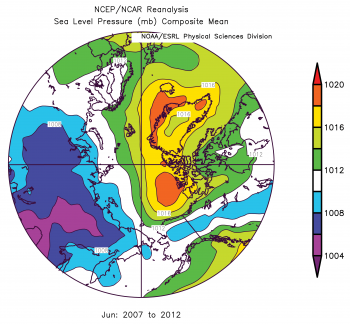 When the Arctic Oscillation is in a negative mode or phase, sea level pressure is higher than normal over the central Arctic and lower than normal over middle latitudes. This pattern tends to keep the high Arctic relatively warm. It brings colder weather to Europe and North America because air masses can cross into and out of the high Arctic more easily. This pattern tends to favor the retention of thick ice in the Arctic basin by reducing the outflow of ice through the Fram Strait and strengthening the Beaufort Gyre, a clockwise circular pattern of ice drift in the central Arctic. The opposite conditions generally hold for a positive Arctic Oscillation pattern. The specific influence of this winter’s negative Arctic Oscillation will depend not only on the strength of the sea level pressure anomaly, but also on the location of the sea level pressure center of action. While a negative Arctic Oscillation pattern tends to favor more ice in summer, this was not the case during the extreme negative Arctic Oscillation winter of 2009 to 2010. The overall effect on the ice cover remains to be seen. Recent studies have argued that that strong warming of the atmosphere in autumn from summer sea ice loss favor the negative Arctic Oscillation phase. While the year began with lower than average extent for the Arctic as a whole, extent in the Bering Sea was at record high levels for much of the winter. The seasonal decline of ice extent began slowly, such that in mid-April, extent for the Arctic as a whole was briefly near average levels. 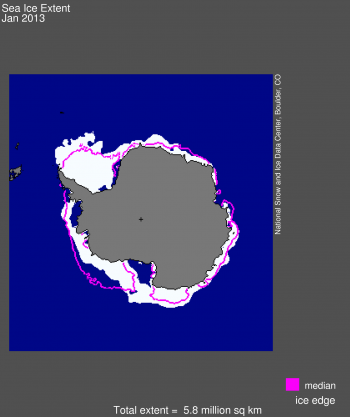 Extent began dropping rapidly beginning in May, and by the end of the melt season on September 16, extent was at the lowest level recorded in the satellite record of 3.41 million square kilometers (1.32 million square miles). While summer weather conditions were not as favorable for ice loss as during 2007, the year of the previous record low, an unusually strong cyclone in August helped to quickly break up the already thin and fragmented ice cover in the Chukchi Sea. This cyclone—remarkable in its intensity and its duration—lasted for thirteen days, of which ten days were spent in the Arctic basin. 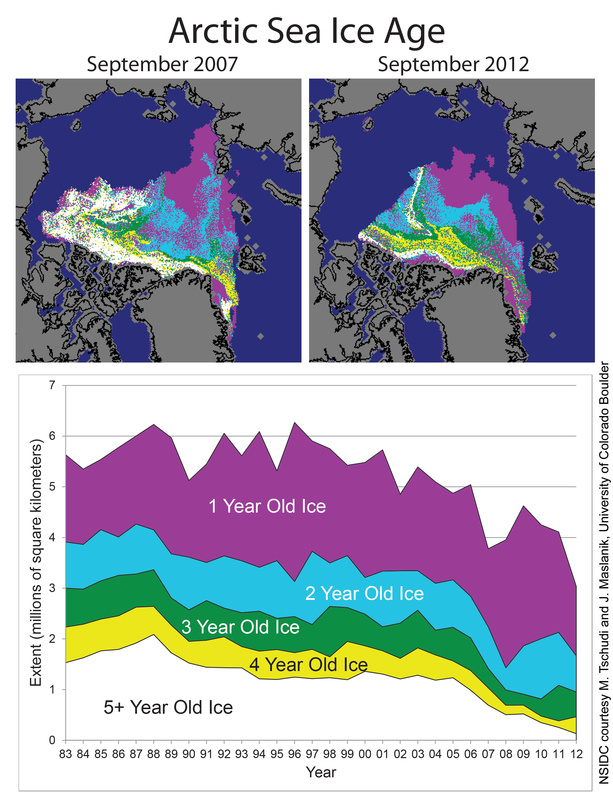 While it appears that a record low extent would have been reached even without the cyclone, thinning over the last several decades has made the ice more vulnerable to such storms, compared to earlier decades when the Arctic Ocean was dominated by thick, multiyear ice. The annual average extent is now declining at a rate of -4.5 percent per decade relative to the 1979 to 2000 average and -4.6 percent per decade relative to the 1981 to 2010 average. The 1981 to 2010 period is the 30-year climatology used by the National Oceanic and Atmospheric Administration (NOAA) for their climate normals. Thirty years is a commonly-used period to define average or normal climate conditions. It is long enough to capture much climate variability, such as the different modes of the Arctic Oscillation, and short enough to be relevant for human timescales, such as agricultural cycles. NOAA updates its climate normals every ten years. 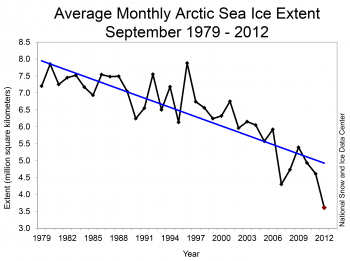 For Arctic sea ice, use of the 1981 to 2010 period results in a lower extent than the 1979 to 2000 period, as seen in Figure 5, because the low extents of the last decade are included. Record low ice extent was not the only remarkable event in the north. In June, Northern Hemisphere land snow cover set a new record for the least amount of snow cover in the 45-year record. A month later, the Greenland ice sheet experienced melt over more than 90 percent of its surface area, the largest melt extent recorded during the satellite data record. Simmonds, I. and I. Rudeva. 2012. The great Arctic cyclone of August 2012. 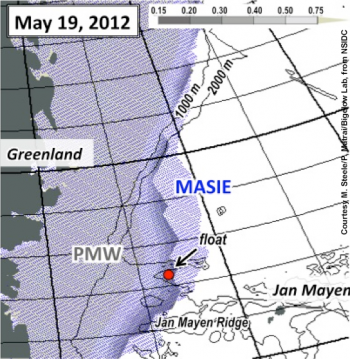 Geophysical Research Letters 39, L23709, doi:10.1029/2012GL054259. Jaiser, R., K. Dethloff, D. Handorf, A. Rinke, and J. Cohen. 2011. Impact of sea ice cover changes on the Northern Hemisphere atmospheric winter circulation. Tellus A, 64, 11595, doi:10.3402/tellusa.v64i0.11595. Stroeve, J. C., J. Maslanik, M. C. Serreze, I. Rigor, W. Meier, and C. Fowler. 2011. 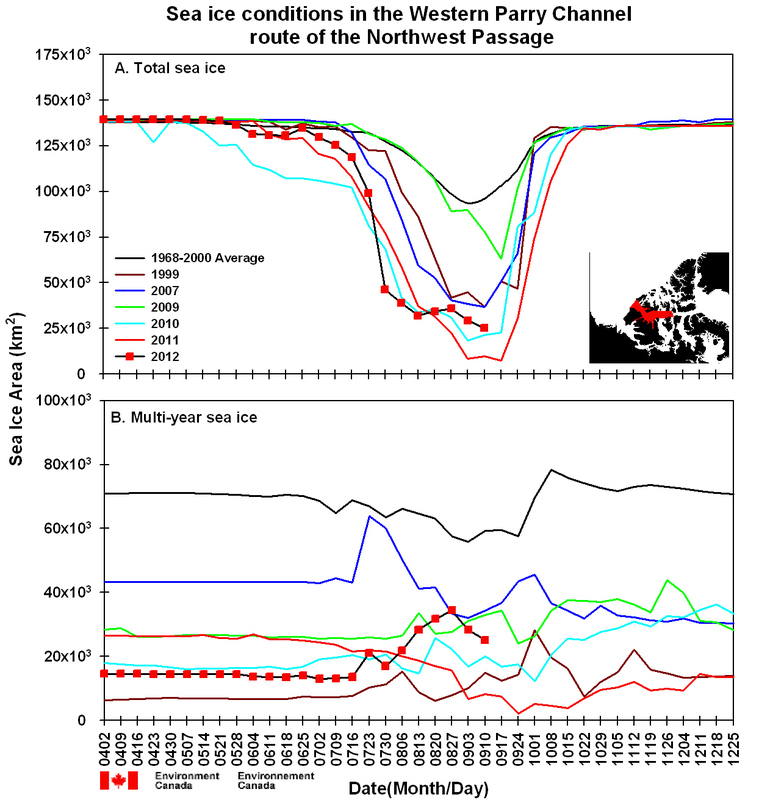 Sea ice response to an extreme negative phase of the Arctic Oscillation during winter 2009/2010, Geophysical Research Letters 38, L02502, doi:10.1029/2010GL045662. 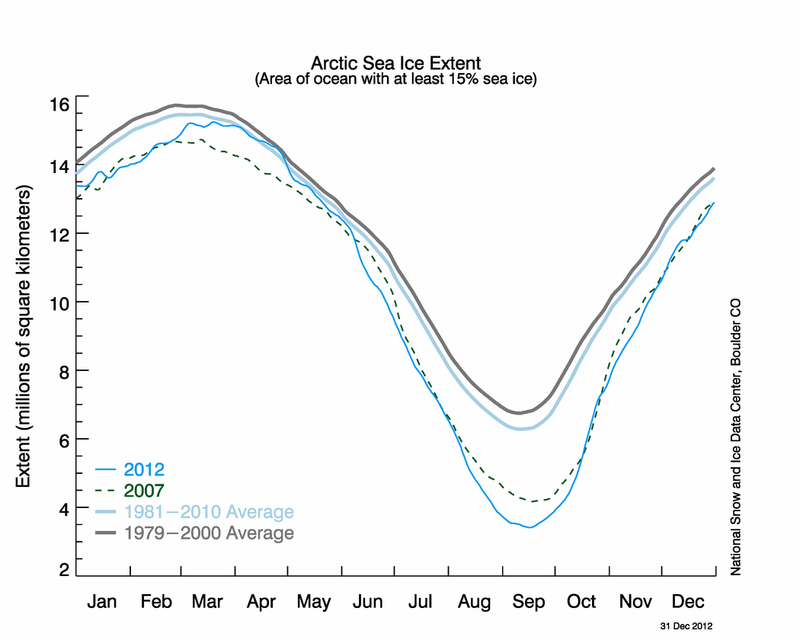 For the Arctic as a whole, ice growth for November was faster than average. However, the Kara and Barents seas remained largely ice free, contributing to above-average air temperatures in these regions. 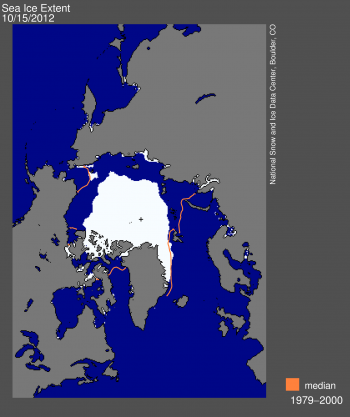 November average sea ice extent was 9.93 million square kilometers (3.83 million square miles). This is 1.38 million square kilometers (533,000 square miles) below the 1979 to 2000 average for the month and is the third lowest November extent in the satellite record. By the end of the month, the central Arctic Ocean had almost completely frozen over. However, the Barents and Kara seas remained largely ice free. Extent remained below normal in the Baffin Bay and Hudson Bay, but ice extent in the Bering Sea by the end of the month was greater than average, continuing a pattern seen in recent years. 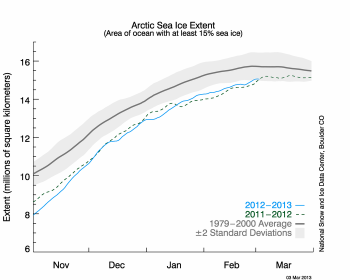 Extent in the Bering Sea was at record high levels last winter. Figure 2. The graph above shows Arctic sea ice extent as of December 2, 2012, along with daily ice extent data for the previous five years. 2012 is shown in blue, 2011 in orange, 2010 in pink, 2009 in navy, 2008 in purple, and 2007 in green. The 1979 to 2000 average is in dark gray. The gray area around this average line shows the two standard deviation range of the data. 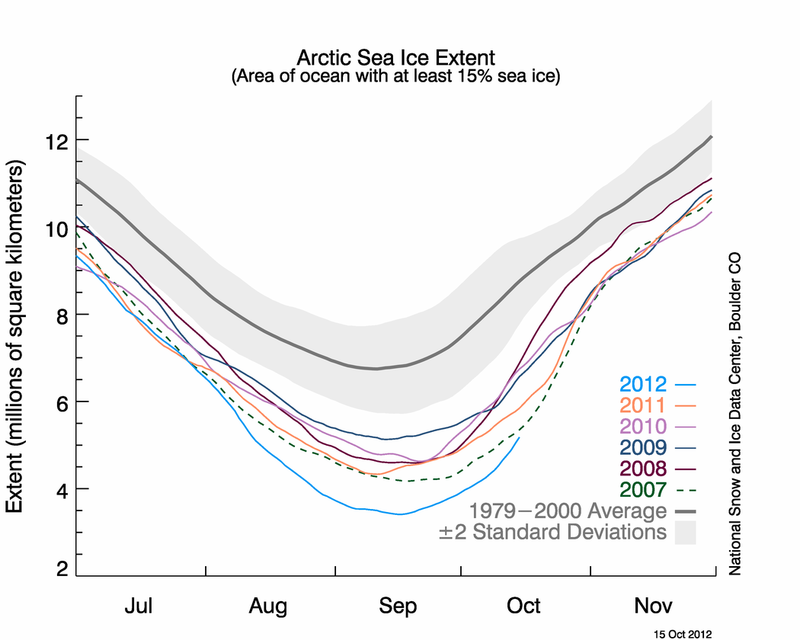 Sea Ice Index data. Extent can increase quickly during November because there is little solar energy and the ocean is rapidly losing the heat that it gained in summer. 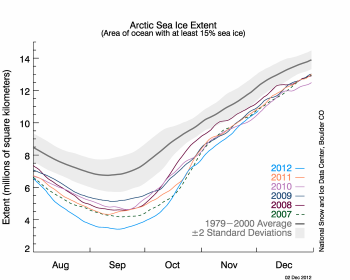 For the Arctic as a whole, ice growth for November 2012 was faster than average, increasing at an average rate of 98,600 square kilometers (38,100 square miles) per day. 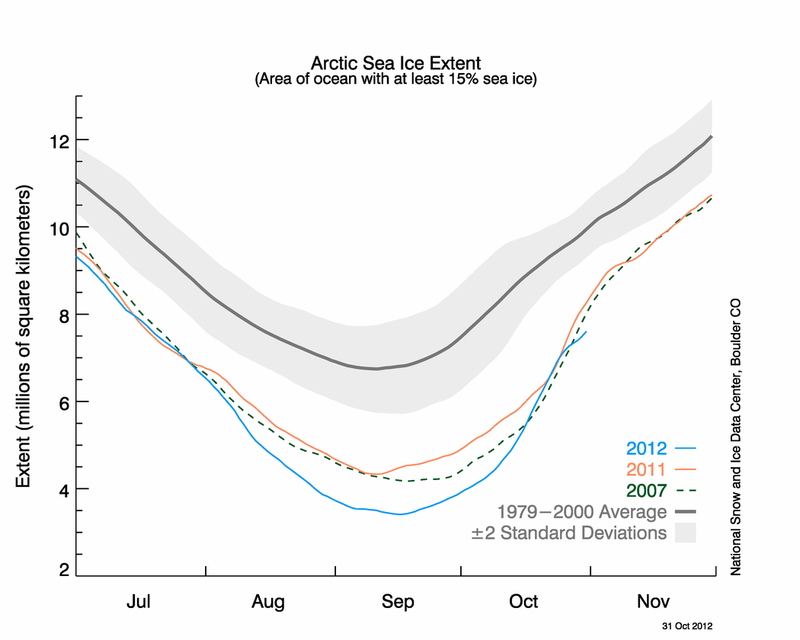 After remaining lower than levels observed in 2007 for most of the month, by November 30 ice extent matched or exceeded extent seen in 2007, 2006, and 2010. Figure 3. 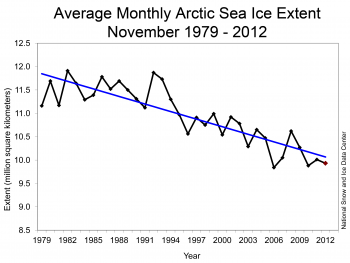 Monthly November ice extent for 1979 to 2012 shows a decline of -4.8% per decade. Average sea ice extent for November 2012 was the third lowest in the satellite record. This marks only the third year in the satellite record that November extent was below 10 million square kilometers (3.86 million square miles). 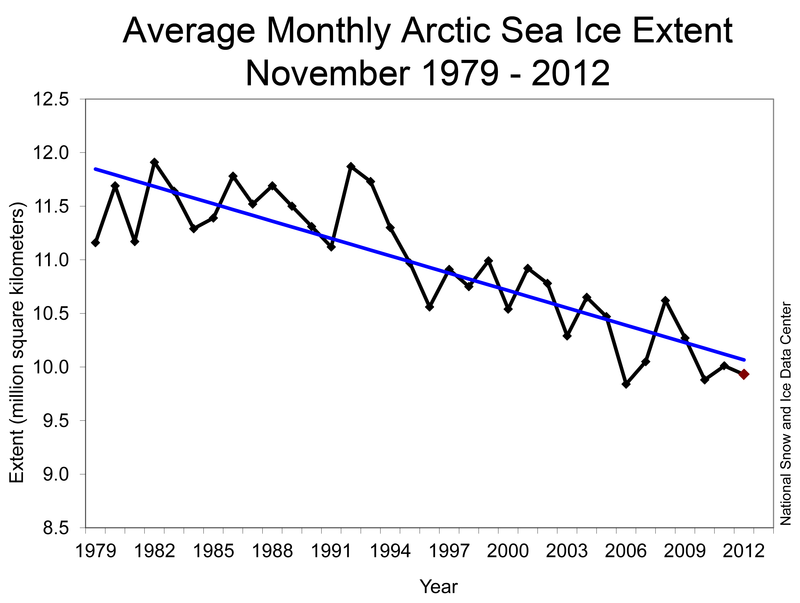 Through 2012, the linear rate of decline for November Arctic ice extent is -4.8% per decade relative to the 1979 to 2000 average. Figure 4. This image shows air temperature anomalies at the 925 hPa level averaged for November 2012, compared to averages over the period 1981 to 2010. Temperatures were above average over the East Siberian, Barents, and Kara seas. November air temperatures at the 925 hPa level (approximately 3,000 feet) were above average over most of the Arctic Ocean. Notably, temperatures in the Barents and Kara seas were up to 6 degrees Celsius (11 degrees Fahrenheit) higher than average. This reflects in part the lingering open water in the regions, allowing strong upward transfers of heat from the ocean to the atmosphere. Unusually strong winds from the south contributed to the warmth and also helped keep the region ice free. More striking were the unusually warm conditions over the ice-covered East Siberian Sea, where temperatures were 6 degrees Celsius (11 degrees Fahrenheit) above average. This appears to be due to persistent high pressure over the Bering Strait. Southerly winds on the west side of the high-pressure zone brought warm air into the East Siberian region. Colder, northerly winds on the east side of the high-pressure zone help explain the higher-than-average extent in the Bering Sea. On September 16, Arctic sea ice appeared to have reached its minimum extent for the year of 3.41 million square kilometers (1.32 million square miles). This is the lowest seasonal minimum extent in the satellite record since 1979 and reinforces the long-term downward trend in Arctic ice extent. 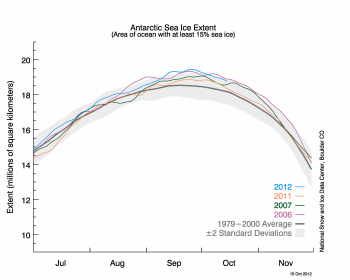 The sea ice extent will now begin its seasonal increase through autumn and winter. 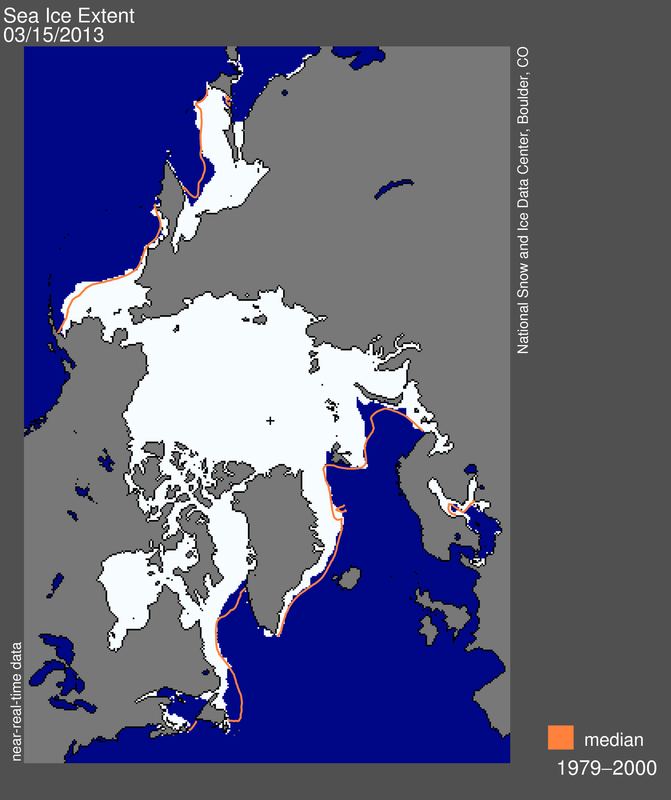 On September 16, 2012 sea ice extent dropped to 3.41 million square kilometers (1.32 million square miles). This appears to have been the lowest extent of the year. 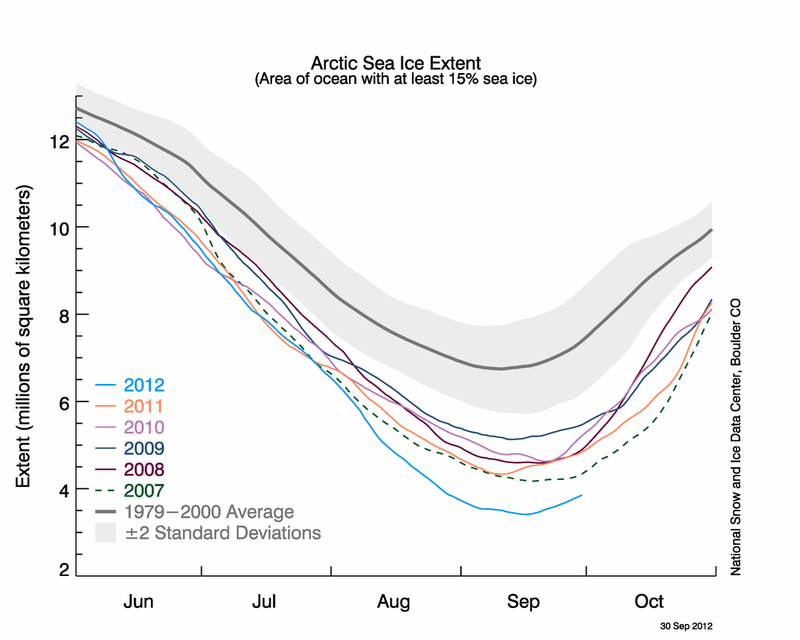 In response to the setting sun and falling temperatures, ice extent will now climb through autumn and winter. 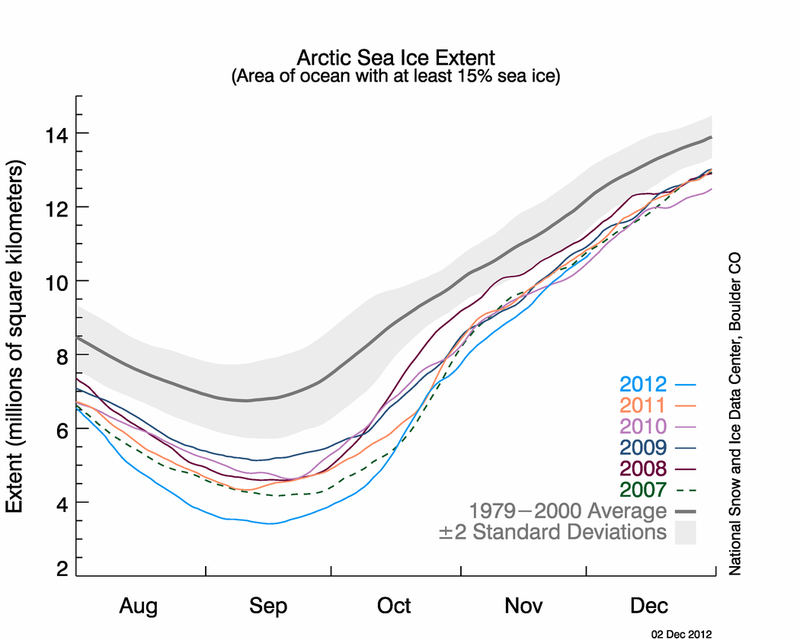 However, a shift in wind patterns or a period of late season melt could still push the ice extent lower. The minimum extent was reached three days later than the 1979 to 2000 average minimum date of September 13. This year’s minimum was 760,000 square kilometers (293,000 square miles) below the previous record minimum extent in the satellite record, which occurred on September 18, 2007. This is an area about the size of the state of Texas. The September 2012 minimum was in turn 3.29 million square kilometers (1.27 million square miles) below the 1979 to 2000 average minimum, representing an area nearly twice the size of the state of Alaska. This year’s minimum is 18% below 2007 and 49% below the 1979 to 2000 average. Figure 2. 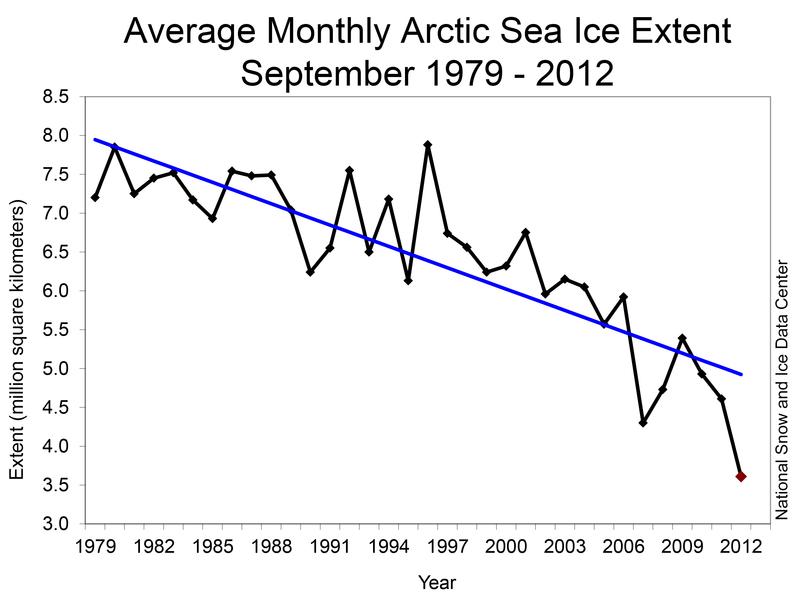 The graph above shows Arctic sea ice extent as of September 17, 2012, along with daily ice extent data for 2007 and 2005, the previous record low years. 2012 is shown in blue and 2007 in green. The gray area around the average line shows the two standard deviation range of the data. 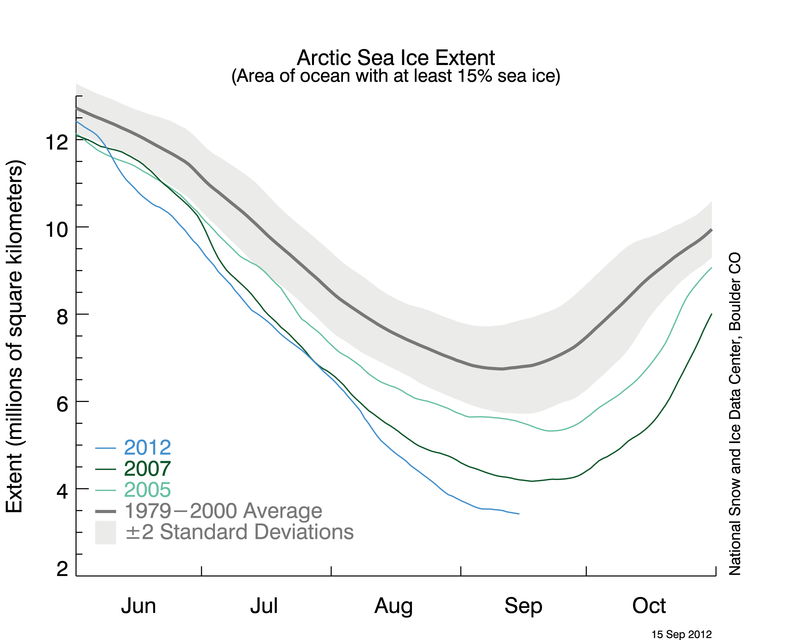 Sea Ice Index data. The six lowest seasonal minimum ice extents in the satellite record have all occurred in the last six years (2007 to 2012). In contrast to 2007, when climatic conditions (winds, clouds, air temperatures) favored summer ice loss, this year’s conditions were not as extreme. 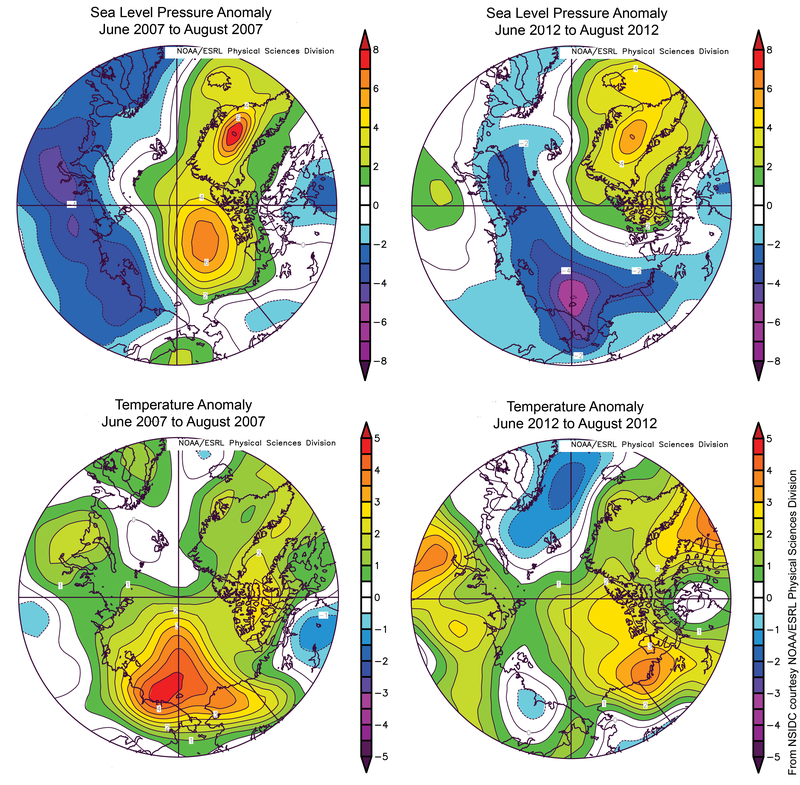 Summer temperatures across the Arctic were warmer than average, but cooler than in 2007. The most notable event was a very strong storm centered over the central Arctic Ocean in early August. It is likely that the primary reason for the large loss of ice this summer is that the ice cover has continued to thin and become more dominated by seasonal ice. This thinner ice was more prone to be broken up and melted by weather events, such as the strong low pressure system just mentioned. The storm sped up the loss of the thin ice that appears to have been already on the verge of melting completely. Figure 3. 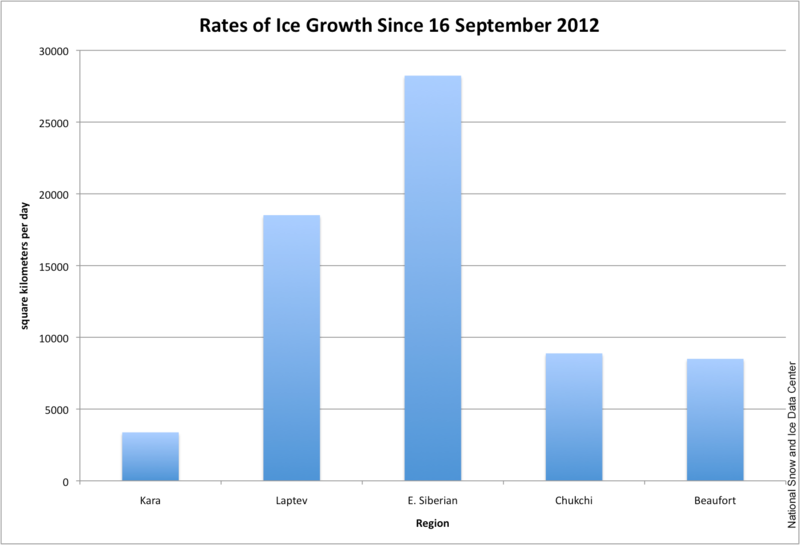 The image above shows the different distribution of ice extent at the time of the September 2012 minimum, compared to the September 2007 minimum. 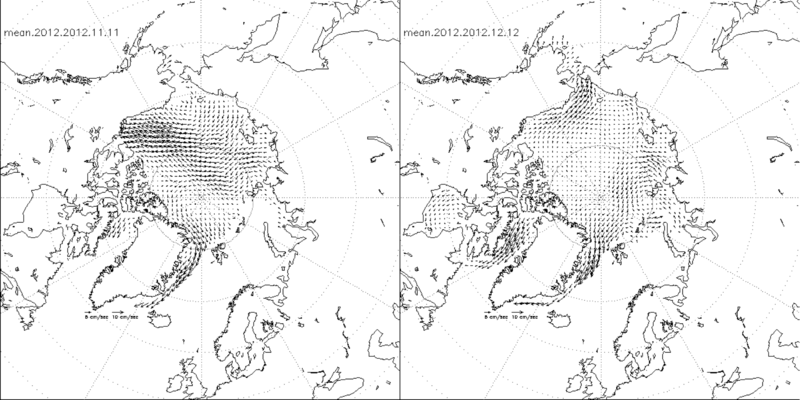 Dark gray indicates where ice extent was present only in 2007; white indicates where ice extent was present only in 2012; and light gray shows where ice extent was present in both 2007 and 2012. 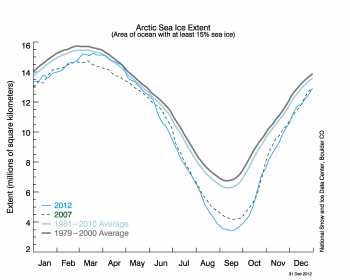 The spatial pattern of ice extent at this year’s seasonal minimum is different than that observed for 2007. This year the ice is more extensive in some parts of the central Arctic Ocean. 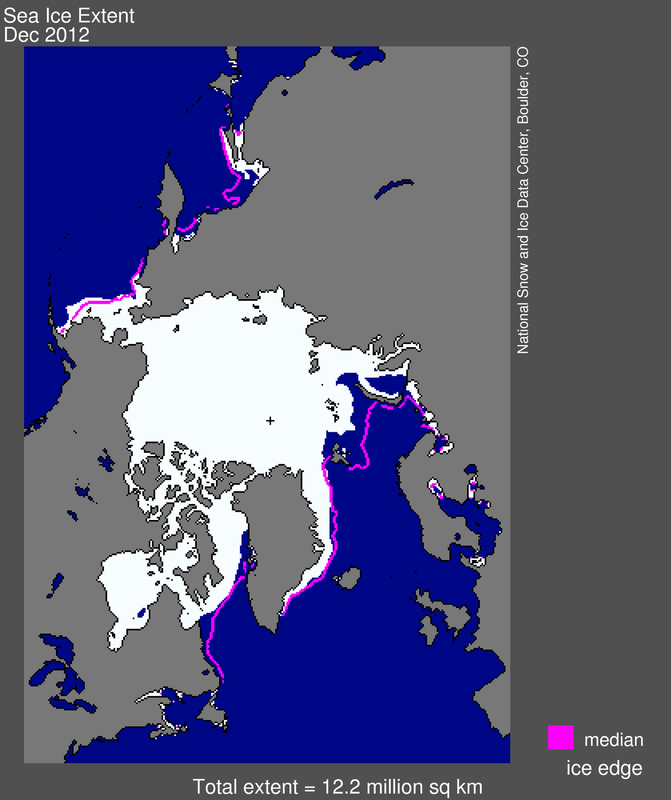 However, the ice is less extensive this year compared to 2007 in the Beaufort Sea, the western Laptev Sea, the East Greenland Sea, and parts of the Canadian Archipelago. As mentioned in our previous post, the Northern Sea Route opened around mid August this year, compared to 2007 when a tongue of ice extended to the coast, blocking the route throughout the summer. Note that the dates and extents of the minimums have changed since we originally posted in 2007; see our Frequently Asked Questions for more information. On September 17, Arctic sea ice extent was 3.41 million square kilometers. Within the next couple of days, we expect to announce that the minimum extent has been reached for the year. Sea ice extent for September 17 was 3.41 million square kilometers (1.32 million square miles). Weather conditions near the ice edge heavily influence the timing of the minimum, which has occurred as late as September 23. We are now five days past the 1979 to 2000 average minimum date of September 13. The decline has slowed in recent days and the minimum will likely be confirmed any day now. The current extent is 760,000 square kilometers (293,000 square miles) below the previous record minimum extent in the satellite record (4.17 million square kilometers or 1.61 million square miles) which occurred on September 18, 2007. This difference is larger than the size of the state of Texas. 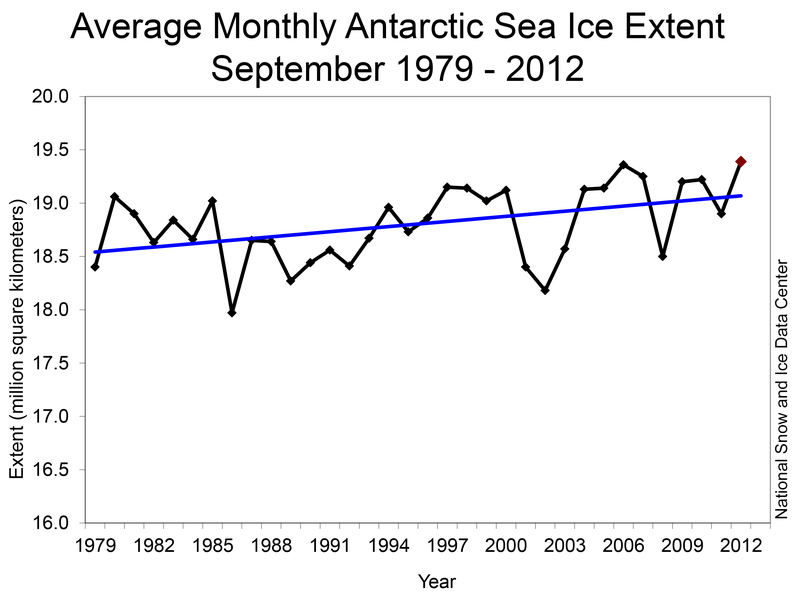 The ice extent currently tracks nearly 50% below the 1979 to 2000 average minimum extent. Figure 2. 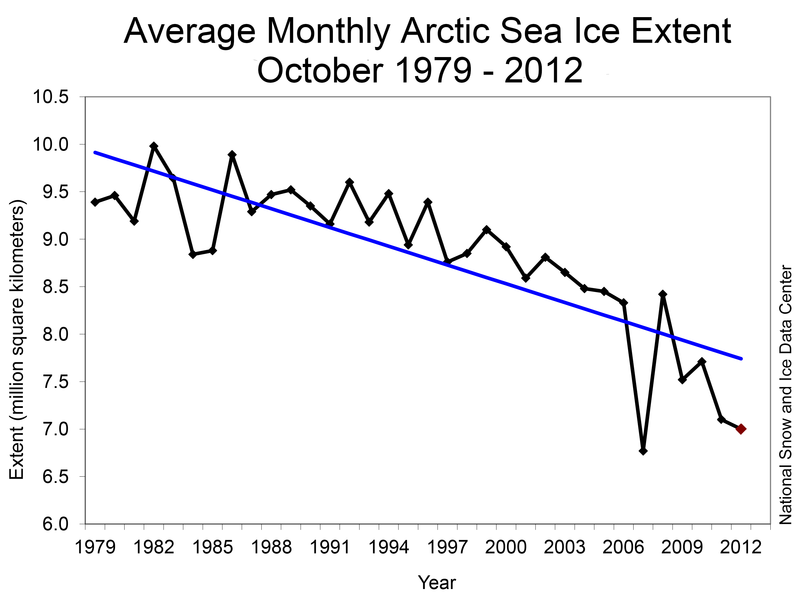 The graph above shows Arctic sea ice extent as of September 17, 2012, along with daily ice extent data for 2007. 2012 is shown in blue and 2007 in green. The gray area around the average line shows the two standard deviation range of the data. 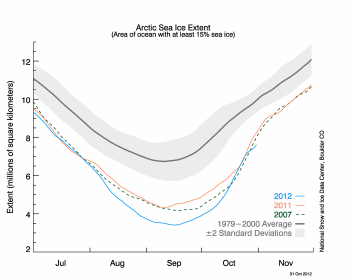 Sea Ice Index data. Since September 1, extent declined 316,000 square kilometers (122,000 square miles), or 19,800 square kilometers (7,600 square miles) per day. 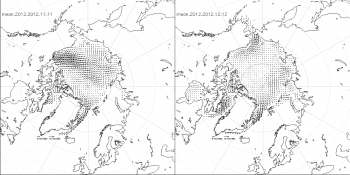 Freeze up has begun over the high latitude Arctic areas, such as the North Pole, and extent has started to increase in the Beaufort Sea region. However, extent is still decreasing on the Atlantic side of the Arctic, leading to the continued overall decline in recent days. The Northern Sea Route along the coast of Siberia has been largely free of ice since mid August. This is in contrast with 2007, when a persistent tongue of ice reaching the coast of the Laptev Sea clogged the Northern Sea Route. Figure 3. 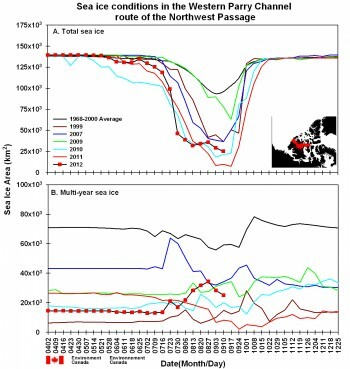 This time series shows total sea ice area (top) and multiyear ice area (bottom) for selected years within the Western Parry Channel route of the Northwest Passage. The black line with red dots shows 2012, and other colors show ice conditions in different years. 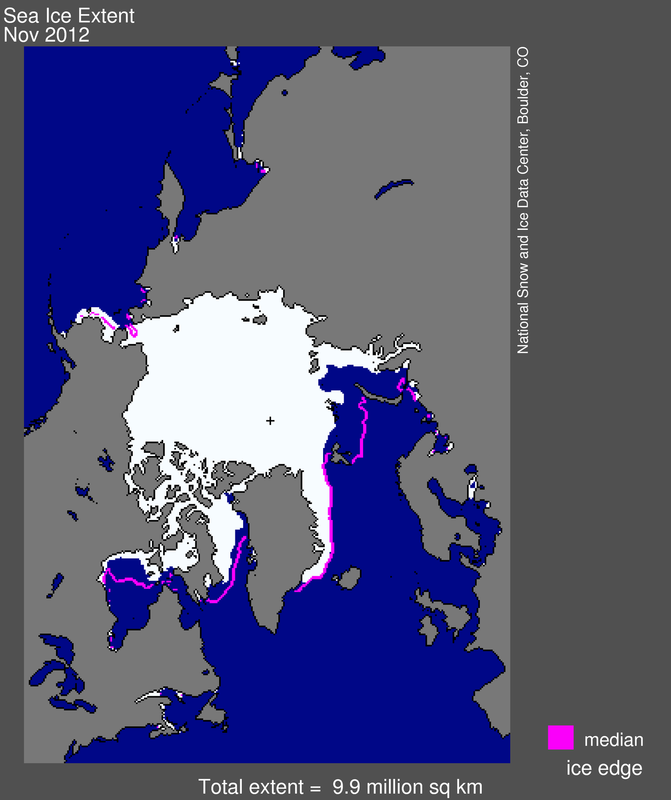 The situation in the Northwest Passage this year also contrasts with 2007. Both the narrow and shallow southern route used by the late polar explorer Roald Amundsen and the wide and deep northern route through the Parry Channel opened in 2007. This year only the southern route has opened. According to Stephen Howell of the Canadian Ice Service, rapid ice loss occurred in the Parry Channel in July. However, due in part to the August storm, a subsequent influx of multiyear ice from the north has kept at least some of the channel blocked. These different patterns of ice loss in the sea routes between 2007 and 2012 highlight how a focus on overall total extent can overshadow regional aspects that have important implications. That 2007 was a record low extent at the time meant nothing to a ship trying to traverse the Northern Sea Route; likewise, the new record this year was meaningless to a ship trying to navigate through the Parry Channel. 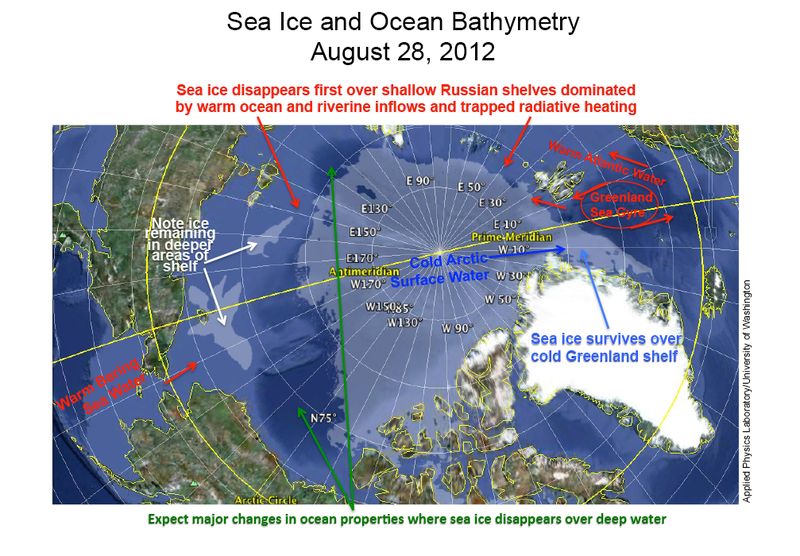 Conditions in the Chukchi Sea, where Shell has started to drill for oil, provide another example. Shell’s operations were delayed in part because of greater than expected ice cover in the early summer. In the late summer, although passive microwave data showed that the Chukchi Sea was nearly ice-free, small floes of ice threatened Shell’s drilling platform, forcing the company to temporarily cease operations in the Arctic. Figure 4. Above are photos of varying sea ice conditions north of Svalbard. The top photo shows shows denser ice cover, around 90% concentration, with a mixture of small floes and brash ice (i.e., slushy ice remnants of melt). The bottom photo shows lower concentrations of small ice floes with considerable open water. NSIDC scientist Julienne Stroeve has been traveling in the Arctic by ship, taking sea ice and temperature measurements on the Atlantic side of the Arctic Ocean. Her reports also show the regional variability of the ice cover. She reached the ice edge on September 10 at roughly 82 degrees North latitude, 15 degrees East longitude (essentially due north of Svalbard). Concentrations were quite high (around 90%) at the ice edge, but as the ship cruised north, concentration dropped to about 40% with considerable regions of open water. Since entering the ice, Stroeve has encountered an average of up to 65% ice concentration primarily consisting of small floes (20 to 50 meters, or 66 to 164 feet) of mostly first-year ice. These floes are too small and thin to safely embark on to take measurements. However, the ship eventually found larger floes and Stroeve took ice thickness measurements indicating thicknessess of around 2 meters (6.5 feet). So far, air temperatures have remained above freezing and Stroeve has not observed any ice formation. The surface measurements taken by Stroeve and other scientists on board the ship are useful for validating satellite data and will provide more detail on the state of the sea ice cover. Stroeve sighted several polar bears, including a mother and her cub.